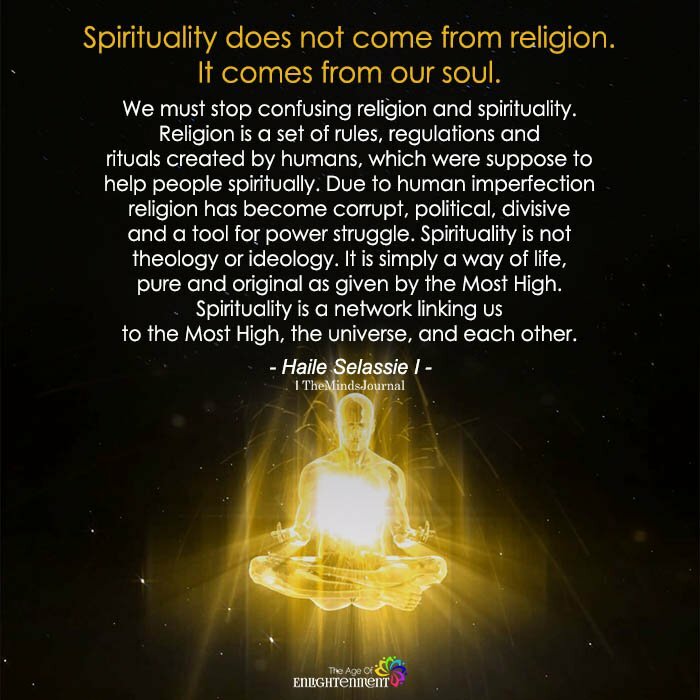 Spirituality does not come from religion. It comes from our soul. We must stop confusing religion and spirituality. Religion is a set of rules, regulations, and rituals created by humans, which were supposed to help people spiritually. Due to human imperfection religion has become corrupt, political, divisive and a tool for power struggle. Spirituality is not theology or ideology. It is simply a way of life, pure and original as given by the Most High. Spirituality is a network linking us to the Most High, the universe, and each other. Zacha Evetts weren’t we just talking about this? that’s why if we combine ..science..＆religion ..shld..Be balance. Spiritually to me is a feeling, a knowing. Religon tells people how they should feel. Modern “spirituality” is just a big scam to trick people out of money. Buster Casey It’s all a scam. Religion is for people that have no self control period.